If you want to pick your own, it is EASY! We will give you a bushel and some nippers, and above is what you will find in our vineyard. Nothing but gorgeous ripe bunches of the sweetest, most fragrant grapes you will ever see! Some customers know the grapes are ready to pick just when they drive by the farm. The sweet perfume of the Concord grapes wafts over the land with every breeze. One of our greatest pleasures is to sit on the porch, look at the mountains, and smell the vineyard on a cool autumn evening. We invite you to share our experience. Our Customers - We love them!! 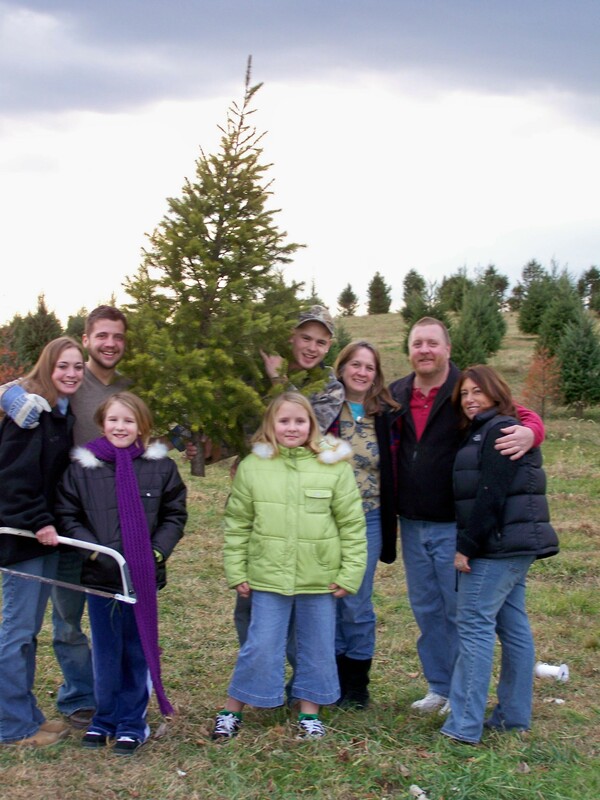 Here are some of our new friends getting the Christmas spirit and a beautiful tree, too! 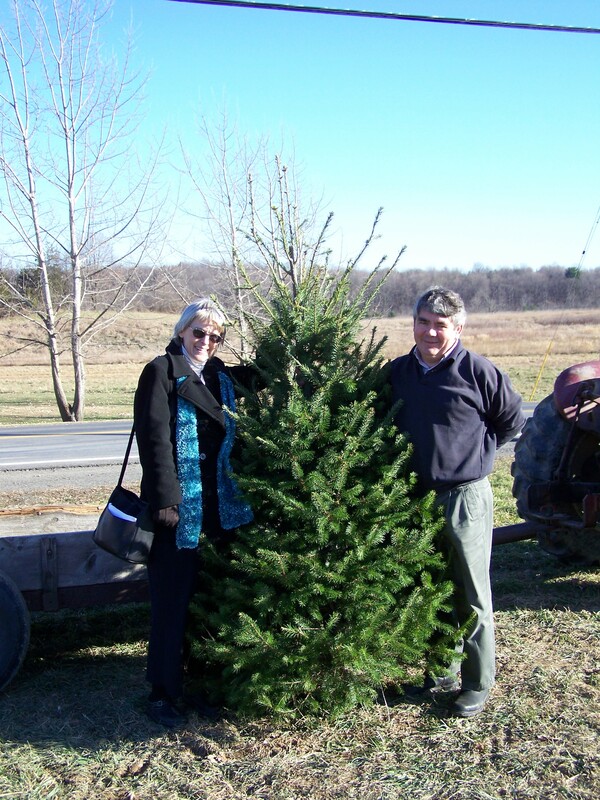 The VanValkenburgh-Gorendo Family with a whopper of a tree!! What a pretty tree for Craig and Dee! 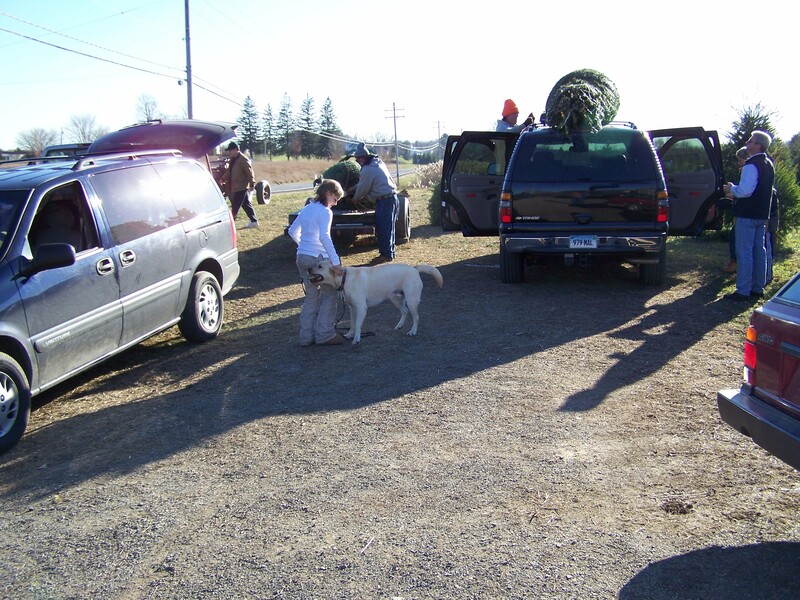 Ken helps the Morgan family secure their tree for the trip home. Here are some of our friends enjoying our sweet, delicious Concord grapes. Our friend Johnny (left), a backyard grape grower from Latham, discussing vineyard ideas with Ken Heller. We love to share ideas and advice with fellow grape enthusiasts! Rob, Allison (6 yrs. ), and Anna (14 mos.) of East Greenbush display their Concord grapes after a fun afternoon of picking. Rob and his family plan to both snack on their bunches, and share them with neighbors- lucky neighbors! You are never too young - or too old! - to begin enjoying grapes! George from Hyde Park let us do the picking, and chose a two quart basket of blue beauties. They will fit perfectly in the saddle bag of his gleaming 1987 Goldwing Interstate. He plans to share this bunch with his Uncle Tom. From helicopter to horseback, any mode of transportation is suitable when you want grapes! Bob & Cindy from (one of our favorite towns) Winsted, Connecticut, found us on the internet! After clipping two heaping bushels of our Concord grapes, Cindy picked up two jars of Sara's homemade pumpkin butter. Here they are posing with Al after a friendly chat. Thanks Bob and Cindy! Your enthusiasm is infectious! Rosemary and Bob win the prize for travelling the farthest visit our farm market. Having picked in France, they came all the way from Cambridge, England to pick our American grapes. While we would love to say our farm was the reason for their holiday on this side of the pond, we feel lucky they chose our farm to get a taste of rural American life. What a pleasure to meet you both! We thank all of our friends, old and new, for allowing us to use these pictures. Without all of you, there would be no Heller's Farm.